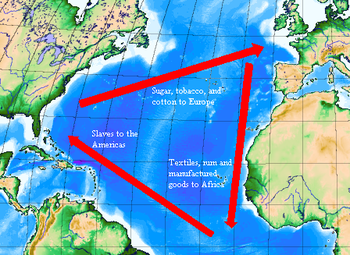 Triangular trade or triangle trade is a historical term indicating trade among three ports or regions. Triangular trade usually evolves when a region has export commodities that are not required in the region from which its major imports come. Triangular trade thus provides a method for rectifying trade imbalances between the above regions. Historically the particular routes were also shaped by the powerful influence of winds and currents during the age of sail. For example, from the main trading nations of Western Europe, it was much easier to sail westwards after first going south of 30 N latitude and reaching the so-called "trade winds"; thus arriving in the Caribbean rather than going straight west to the North American mainland. Returning from North America, it is easiest to follow the Gulf Stream in a northeasterly direction using the westerlies. A similar triangle to this, called the volta do mar was already being used by the Portuguese, before Christopher Columbus' voyage, to sail to the Canary Islands and the Azores. Columbus simply expanded this triangle outwards, and his route became the main way for Europeans to reach, and return from, the Americas. The best-known triangular trading system is the transatlantic slave trade that operated from the late 16th to early 19th centuries, carrying slaves, cash crops, and manufactured goods between West Africa, Caribbean or American colonies and the European colonial powers, with the northern colonies of British North America, especially New England, sometimes taking over the role of Europe. The use of African slaves was fundamental to growing colonial cash crops, which were exported to Europe. European goods, in turn, were used to purchase African slaves, who were then brought on the sea lane west from Africa to the Americas, the so-called Middle Passage. Despite being driven primarily by economic needs, Europeans sometimes had a religious justification for their actions. In 1452, for instance, Pope Nicholas V, in the Dum Diversas, granted to the kings of Spain and Portugal "full and free permission to invade, search out, capture, and subjugate the Saracens [Muslims] and pagans and any other unbelievers ... and to reduce their persons into perpetual slavery." 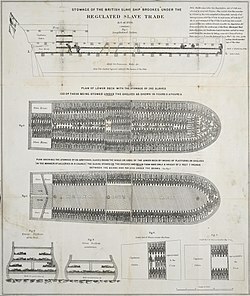 Diagram illustrating the stowage of African slaves on a British slave ship. A classic example is the colonial molasses trade. Merchants purchased raw sugar (often in its liquid form, molasses) from plantations in the Caribbean and shipped it to New England and Europe, where it was sold to distillery companies that produced rum. The profits from the sale of sugar were used to purchase rum, furs, and lumber in New England which merchants shipped to Europe. With the profits from the European sales, merchants purchased Europe's manufactured goods, including tools and weapons. Then the merchants shipped those manufactured goods, along with the American sugar and rum, to West Africa where they were bartered for slaves. The slaves were then brought back to the Caribbean to be sold to sugar planters. The profits from the sale of slaves in Brazil, the Caribbean islands, and the American South were then used to buy more sugar, restarting the cycle. The trip itself took five to twelve weeks. 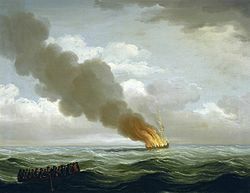 The loss of the slaver Luxborough Galley in 1727 ("I.C. 1760"), lost in the last leg of the triangular trade, between the Caribbean and Britain. However, because of several disadvantages that slave ships faced compared to other trade ships, they often returned to their home port carrying whatever goods were readily available in the Americas and filled up a large part or all of their capacity with ballast. Other disadvantages include the different form of the ships (to carry as many humans as possible, but not ideal to carry a maximum amount of produce) and the variations in the duration of a slave voyage, making it practically impossible to pre-schedule appointments in the Americas, which meant that slave ships often arrived in the Americas out-of-season. When the ships did reach their intended ports, only about 90% of the passengers survived the journey across the middle passage. Due to the slaves being transported in tight, confined spaces, a significant percentage of the group that started perished on board or shortly after arrival due to disease and lack of nourishment. [unreliable source?] Cash crops were transported mainly by a separate fleet which only sailed from Europe to the Americas and back mitigating the impact the slaves involvement brought forth. The Triangular trade is a trade model, not an exact description of the ship's route. A 2017 study provides evidence for the hypothesis that the export of gunpowder technology to Africa increased the transatlantic slave trade by making it easier for Africans to enslave each other: "A one percent increase in gunpowder set in motion a 5-year gun-slave cycle that increased slave exports by an average of 50%, and the impact continued to grow over time." New England also made rum from Caribbean sugar and molasses, which it shipped to Africa as well as within the New World. Yet, the "triangle trade" as considered in relation to New England was a piecemeal operation. No New England traders are known to have completed a sequential circuit of the full triangle, which took a calendar year on average, according to historian Clifford Shipton. The concept of the New England Triangular trade was first suggested, inconclusively, in an 1866 book by George H. Moore, was picked up in 1872 by historian George C. Mason, and reached full consideration from a lecture in 1887 by American businessman and historian William B. Weeden. The song "Molasses to Rum" from the musical 1776 vividly describes this form of the triangular trade. The term "triangular trade" also refers to a variety of other trades. A new "sugar triangle" developed in the 1820s and 1830s whereby American ships took local produce to Cuba, then brought sugar or coffee from Cuba to the Baltic coast (Russian Empire and Sweden), then bar iron and hemp back to New England. ^ About.com: The Trans-Atlantic Slave Trade. Accessed 6 November 2007. ^ "Triangular Trade". National Maritime Museum. Archived from the original on 25 November 2011. ^ Curran, Charles E. (2003). Change in Official Catholic Moral Teaching. Mahwah, New Jersey: Paulist Press. p. 67. ^ Scotland and the Abolition of the Slave Trade Archived 2012-01-03 at the Wayback Machine. Accessed 28 March 2007. ^ A. P. Middleton, Tobacco Coast. ^ "Death Toll From The Slave Trade". World Future Fund. Retrieved 9 February 2018. ^ Emmer, P.C. 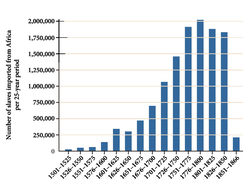 : The Dutch in the Atlantic Economy, 1580–1880. Trade, Slavery and Emancipation. Variorum Collected Studies Series CS614, 1998. ^ Whatley, Warren C. (2017). "The Gun-Slave Hypothesis and the 18th Century British Slave Trade". Explorations in Economic History. doi:10.1016/j.eeh.2017.07.001. ^ Slavery in Rhode Island Slavery in the North Accessed 11 September 2011. ^ Curtis, Wayne. And a Bottle of Rum. New York: Three Rivers Press, 2006–2007. ISBN 978-0-307-33862-4. page 117. ^ Curtis, Wayne. And a Bottle of Rum. New York: Three Rivers Press, 2006–2007. ISBN 978-0-307-33862-4. p. 119. ^ Kurlansky, Mark. Cod: A Biography of the Fish That Changed the World. New York: Walker, 1997. ISBN 0-8027-1326-2. ^ Morgan, Kenneth. Bristol and the Atlantic Trade in the Eighteenth Century. Cambridge: Cambridge University Press, 1993. ISBN 0-521-33017-3. pp. 64–77. ^ Chris Evans and Göran Rydén, Baltic Iron in the Atlantic World in the Eighteenth Century : Brill, 2007 ISBN 978-90-04-16153-5, 273. The Transatlantic Slave Trade Database, a portal to data concerning the history of the triangular trade of transatlantic slave trade voyages.